We’ll admit to being a bit bored with the markets lately – sure, we feel things are a bit heated, but we don’t see any major bubbles brewing in the American equity markets like some commentators. Add that to the fact that trading volumes are low in the summer anyway, the world is fascinated with America’s sixth favorite sport (okay, we kid; the Portugal-US game is on right now) and inflation has been low. And there you have it – last week on Tuesday there was a ‘sharp’ increase in inflation expectations across all the time-frames we’re tracking – 5, 10, 20, and 30 years. 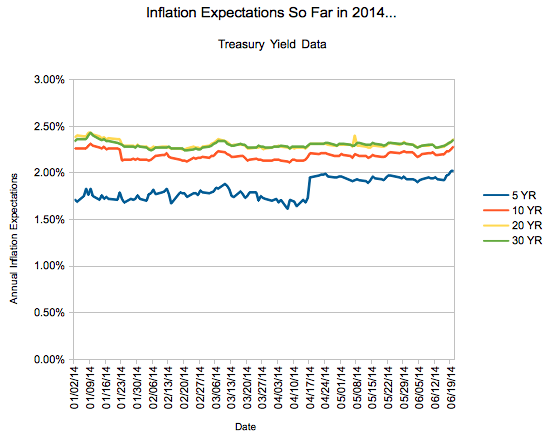 It’s Time to Watch Inflation Again! Well, it had been low. Now, for two consecutive months the year over year inflation rate, measured by the seasonally adjusted CPI, has been at or above 2%. Now, back about 18 months ago we discussed that folks warning us about hidden or ongoing hyperinflation weren’t checking the numbers – and we aren’t ready to shift from that stance. However, it’s time to start paying attention to the ongoing inflation rate, especially if it ticks into the upper 2s or 3s year over year, in the face of increasing wage pressure. So, what are you seeing out there? Is it time for the last few of you to grab cheap long term debt? 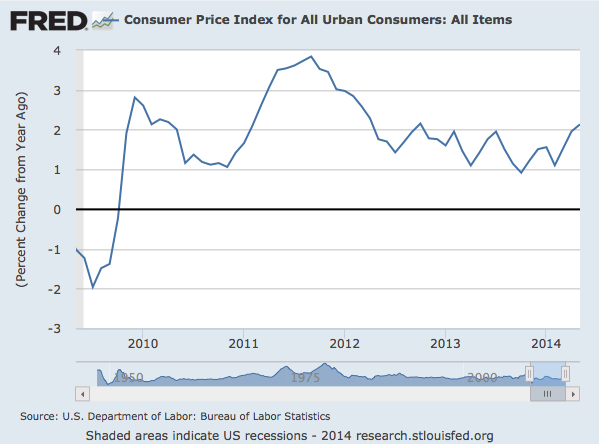 Is the era of 0-2% inflation over? 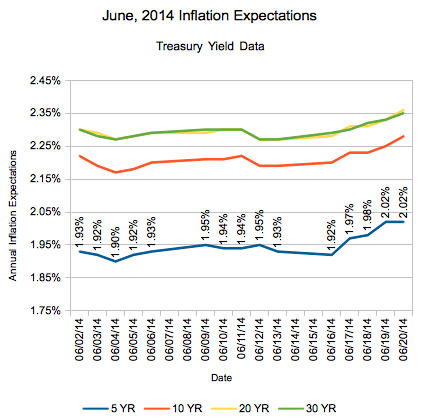 More importantly, is it time to turn an eye back to the market… in the midst of summer? Maybe it’s more basketball than football – after you struggle through an 82 game season, you realize that everyone else, too, made the playoffs – so the playoffs is more like the actual regular season. The playoffs just began, so it’s time to watch (?). Wouldn’t a midweek move suggest it’s tied to Janet Yellen saying, in essence “No seriously, 2% is our target inflation rate… seriously” or am I missing something? It’s definitely Fed-related. I was going to include some dot charts or something to overlay with that third graph, but I think the bigger news is actually the YoY CPI hitting 2 for 2 in a row. At a minimum, it means we won’t float in the mists of -2 to 2 that Japan has been experiencing for so long. As to monetary policy, the Fed has been moving more and more away from putting a hard target on inflation, so it’s impossible to say beyond a few dot charts and the like what they’re thinking (I do like that they include their own inflation expectations graph in the release now). If you’re interested in the money policy side, let me plug ? I just checked – the data only updated through Q1 so far, but it’s interesting to play around with.